1. 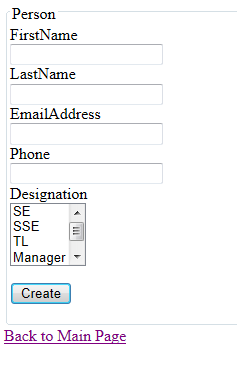 Create a sample project in ASP.Net MVC3 in Visual Studio. 2. Create a model class for Person and Designation. Person record contains some basic information and Designation holds the list of designations. 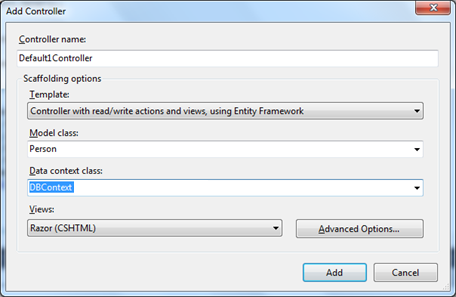 Below is the Code First model Approach using Entity Framework ver. 4.3.1. 3. Create a DBContext class and define DBSet for these entities. 4. Now create a Person controller selecting Controller with read/write actions and select Person as a Model class and DB Context as you Database Context class. 5. Now if you open the Create.cshtml file you will see a drop down list for designation. As in the template file there was a foreign key check. If you run the application form will be shown as below. 6. 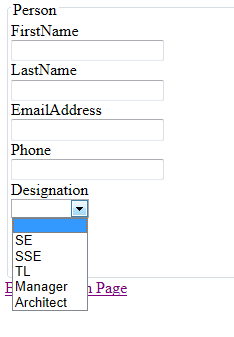 Now let’s change a drop down to list box in the Create.tt file. 7. Delete the previous controller and generate it again. It will generate a ListBox as specified in a tt file. This was the simple example showing how developers can modify existing templates based on their needs and reduce development time.